– Market on water is an association composed of three types of members : full members, active members, supporting members, a board of directors, employees and volunteers. – L’Atelier, Regional Resource Centre of Social and Solidarity Economy / Participates in financing the project by obtaining award of the contest CréaRîF Entreprendre autrement 2010. – 4 clubs Cigales of Île-de-France (Investors Club To An Alternative and Local Management of Solidarity Savings) / financial support. – Regional Delegation of Ile-de-France / Financial Partner for 2012 and distinction in the contest « L’alimentation autrement ». – City of Pantin / Support association in its technical development. – La Rotonde-Place Stalingrad / Receive distributions of the association and make available its restaurant terrace and storage local for free. – Feeling dace factory / Receive association’s crates and stands between the distributions for free. – Cafézoïde (cultural coffee children) / Take over and cook vegetables coming abandoned baskets and unsold Rodonde ’s market. – Blend (communication agency) / Voluntarily designs the visual identity of the association and realize communications materials. – Agricultural Urbanism Lab / Realize for free analysis of the environmental lifecycle. 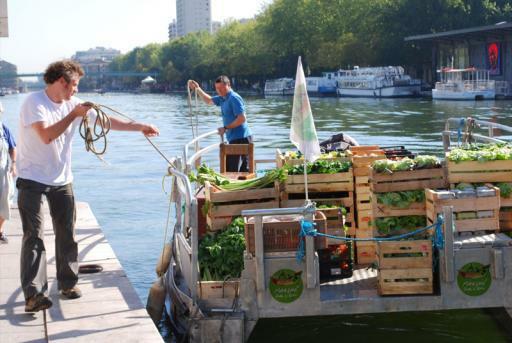 Through its strong convictions based on respect for people and their natural environment, Market on water aims to develop a better knowledge of the agricultural world, its reality and its difficulties. The project wants to turn its action into a participative way, beginning to listen to its members and promoting dialogue around agricultural production. Moreover, Market on water wants to create a direct link between farmers and consumers, which are committed to purchase production at a fairy price and by paying early.